Shah Alam, December 8 –The inaugural Selangor Smart City International Conference 2016 welcomed participants to an exciting start on the morning of Dec 6 at the Saujana Hotel, Shah Alam. The packed conference hall saw a massive turnout of over 500 people for the conference on Day 1, comprising a vibrant and healthy mix of local and international representatives and individuals running the gamut from service providers in Smart City/Smart Tech, tech companies, GLCs, municipals, government agencies, academics and more. The conference was organised by Menteri Besar Incorporated Selangor (MBI), the Smart Selangor Delivery Unit (SSDU) and the Selangor Information Technology and E-Commerce Council (SITEC), with the support of the Selangor State Government, and is a part of the state government’s plans to transform Selangor into a “Smart State” by 2025. Speakers from the first session convene on stage for a Q&A Session with Session Moderator Dr. Fahmi Ngah. In his opening speech, Menteri Besar Selangor Incorporated CEO YM Raja Shahreen Bin YM Raja Othman announced that Selangor would be “developing a caring, smart state” that saw its citizens as the state’s “greatest asset”. The two day conference was split into four sessions. 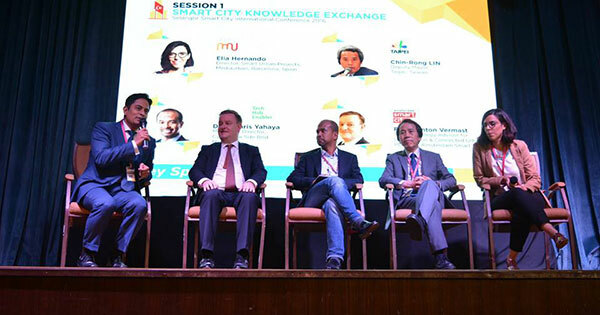 The first three sessions took place on Day 1 (Dec 6), and saw international and local speakers from Barcelona, Amsterdam, Taipei and Cyberjaya as well as tech giants Microsoft, Huawei and IBM in Session 1: Smart City Knowledge Exchange and Session 2: Smart Solutions for Smarter Cities respectively. Just before lunch, the conference segued into the launch of the Smart Selangor Blueprint that sets forth a concerted implementation plan to stage the co-creation of a smart state driven by a strong digital economy and sustainable liveability by 2025. Launched by the Selangor Education, Human Capital Development, Science, Technology and Innovation Exco, Y.B Nik Nazmi Nik Ahmad on behalf of Y.A.B Dato’ Menteri Besar Selangor, Dato’ Seri Mohamed Azmin Ali, the blueprint is a roadmap for driving a more sustainable economic growth for Selangor. The blueprint is a ‘living’ implementation framework which will be reviewed periodically to adapt to fast moving smart city dynamics, technologies, the evolving needs of citizens, businesses and investors. This strategic pivot will bring about key transformational outcomes to realize Selangor’s Smart State aspirations by 2025 and place Selangor as the premier business, travel and living destination in ASEAN. “Reaching these actionable outcomes, in turn, will further empower Selangor to be ASEAN’s premier business, travel and living destination. Essentially, we are reconciling the state, business and Selangor Rakyat’s interests by delivering leading major innovations that will place Selangor as an important economic location in Southeast Asia surpassing other neighboring cities in comparative advantage terms,” Y.M. Raja Shahreen added. Pertinently, for 2017, the state had committed RM26 million for at least 10 more new pilot programs to be expedited under the initiative. In its net effect, as the nation’s economic powerhouse and the most progressive state in Malaysia, the Smart Selangor strategic action plans will further enhance Selangor’s economic outlook as a key driver of growth and prosperity as well as address urban challenges leveraging technology as a key enabler. Session 2 continued post-lunch, after which Session 3: Leveraging IoT & Big Data for Smart Cities continued with speakers from the UK, Malaysia and Taiwan sharing their solutions and ideas on stage. There were a wide variety of innovations shown – everything from large-scale systems to monitor traffic flow across an entire city, to smartphone apps to make it easier to do your shopping. However, despite their differences, all of these inventive ideas had a common theme: they were meant to help ordinary citizens live long, happy and productive lives. Throughout the event there was a strong emphasis on actively making use of technology to solve people’s problems. Over 200 delegates turned up for Day 2 of the Selangor Smart City International Conference, maintaining the strong turnout rate over the course of the conference. The second day saw 21 solutions providers showcasing what they bring to the table in the development and advancement of a Smart City, as well as business matching sessions for 26 companies that were looking to find partners or collaborators in projects. The showcase session, which featured companies from Taiwan, Malaysia, and the UK, ranged in topics and applications, as well as sporting differing ideas for similar problems. Among the more common topics included IoT advances in agriculture and environment control, as well as the use of technology to simplify everyday matters such as grocery shopping and parking. There were also companies specialising in more than one field, though the focus remained on IoT. Also present were several firms which specialised in building management and disaster control. The companies from Taiwan largely brought with them IoT solutions which look to energy efficiency, food quality, logistics, disaster management, building control, and management, among others, whereas the UK teams brought with them solutions centered around security and surveillance, through Aralia Systems and Reward Technology. Solutions providers from Malaysia included HappyFresh and PasarTap as on-demand grocery services, WeStyleAsia and RecomN as platforms that connect services to customers, ParkEasy and MOPPS as parking solutions providers, Dego as a logistics player, and Tourplus as an e-Commerce tourism platform. Dr Lau Cher Han and Eizzar Supiar of Cradle both offered comments after the showcase session, with Dr Lau noting that, while there would be those who will believe that some of the solutions providers were not connected to the Smart City concept, a Smart solution is ultimately one that helps people to live smarter and easier. He further noted that the providers were there with several unconventional methods but all sharing the common goal of helping people lead easier lives. Eizzar noted that it was heartening that large corporations as well as startups were moving towards smarter solutions and offerings, with large corporations working together with startups to further customise solutions to fit their needs. More cooperation is always a good way forward, Eizzar noted. The business matching sessions saw over 160 one-to-one sessions between companies, with discussions focused on the exchange of ideas, the search for collaborators, and offering talents and proposals. With the end of the final business matching discussion, the inaugural Selangor Smart City International Conference was brought to a close.